The current council is delivering on what the former council decided: the car is no longer king in Utrecht. The closer to the city centre, the more people friendly the city has to be. Driving your motor vehicle into the city centre will remain possible when it is absolutely necessary, but it will not be a convenient option. The scarce city space is not to be used for motor traffic passing quickly, but for people living their lives. Something they should be able to do in a safe environment, with low noise levels and a good air quality. To achieve that, former main roads are being redesigned as space for people, where cars are guest. One by one such streets are reopening and sending out the clear signal that motor traffic has to find different routes: wide around the areas where people live. The plan to redesign a former main road around the city centre to become a main cycle route and only a local access street for motor traffic. 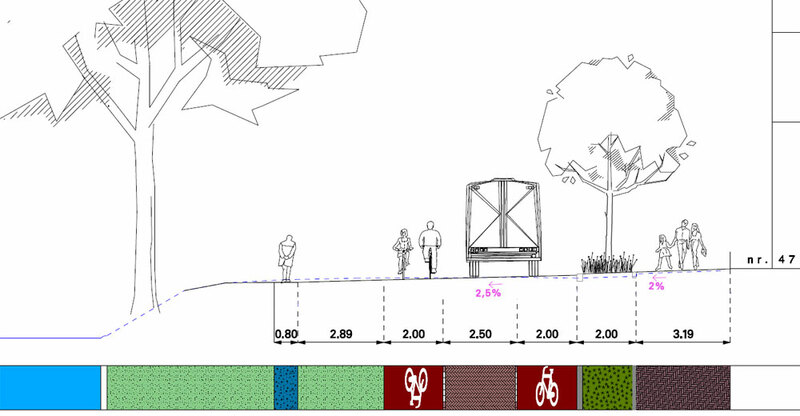 The new widths of the traffic lanes, cycle lanes and pedestrian areas. Utrecht retained most of its city moat. The former defence system with its ramparts was turned into a park in the 19th century. The city walls were taken down and on top of the remains the city built a beautiful park with artificial hills and curved walking paths. A lot of the trees planted at that time are still there for the enjoyment of many. On the city centre side of the moat, the park was largely untouched, but on the outside, over the years, a lot of the space was surrendered to traffic, especially in the second half of the 20th century. 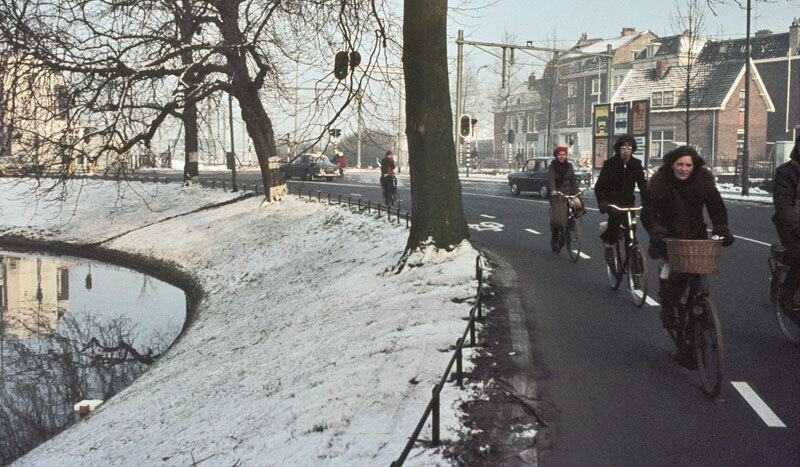 That has been drastically reversed now on the Maliesingel and Tolsteegsingel. In the new design, the main focus is on the cycling infrastructure. The street now has 2-metre-wide one-directional cycle lanes, in red asphalt, to make it an attractive and convenient main cycle route around the historic city centre. To make parking easier, many brand new bicycle parking racks were added. For pedestrians, the sidewalks have been widened, at some places considerably, to have a minimum width of 2 metres. This makes the street also very attractive for walking. The green space of the water front has also been widened. Trees that were very close to the asphalt before, now have much more space again for their roots. 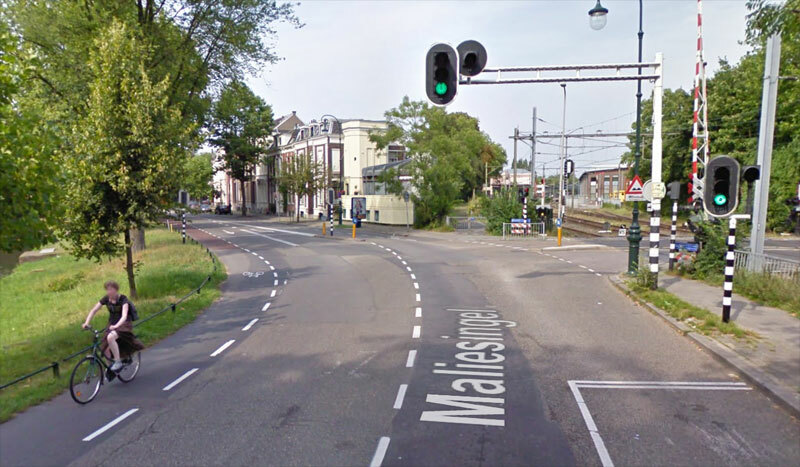 The signalised intersection in 2009 as it is shown in Google StreetView. At the same location today, nothing reminds us that this was a signalised intersection before. A lot of space on the left hand side of the road can now be reused as park, as it had been before the advent of the car. This change comes at the expense of motor traffic. The motor traffic space has been narrowed, from about 5 metres to just 2.5 metres for all traffic in both directions. To make that safely possible, the speed limit has been lowered from 50km/h to 30km/h. If drivers need to pass other vehicles they may use the cycle lanes, but only if they are not used by people cycling. The speed limit will be enforced naturally, because of the brick paving and the narrow lane. A traffic light installation, at the only major junction in the street, has been permanently removed. It had already been switched off in the project to reduce the number of traffic lights. But, you might ask, why didn’t they just build a separated cycle path protected by a line of parked cars? The city didn’t chose to do that, because that would send a completely wrong signal! Namely that this would be a main route for motor traffic. This new design signals exactly the opposite: this is now people’s space, that is only meant to serve as a neighbourhood access street. If you have no business in the area you are not welcome here as a driver of a motor vehicle. These figures are in sharp contrast with the ones the city provides answering questions raised in the public consultation. From a count in March 2015, the city calculated an average of 6,780 motor vehicles and 4,084 cyclists per weekday. 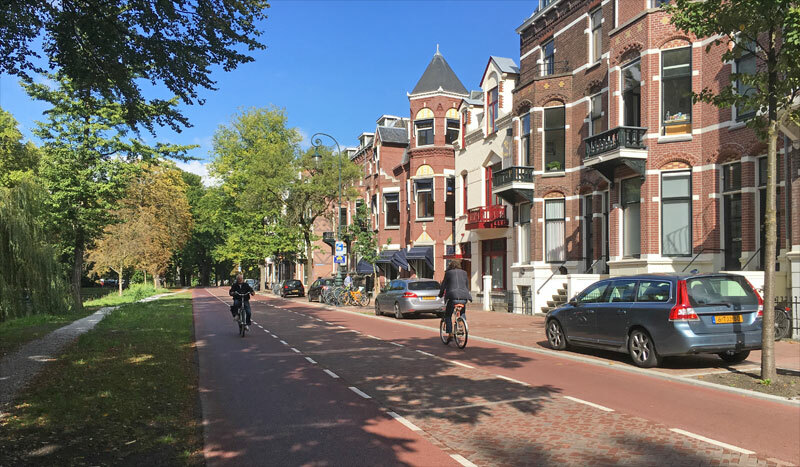 Writing: “We believe that due to the reconstruction this number of motor vehicles will decrease or remain the same, while we anticipate cycling to increase.” With such numbers a cycle street is out of the question. In a cycle street the cycling has to outnumber motor vehicles. 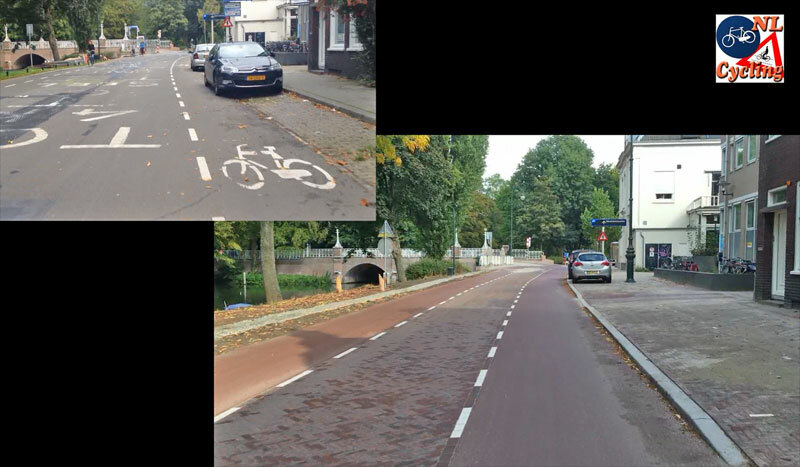 In their October news letter the Utrecht branch of the Cyclists’ Union confirms they are worried about the motor traffic volumes, but they also mention that they do like how the street looks now and that they hope the city is right to expect the number of motor vehicles to decrease. The sidewalks were already continuous at sidestreets, but in the present design superfluous bollards were removed and the new sidewalk surface is even more continuous. 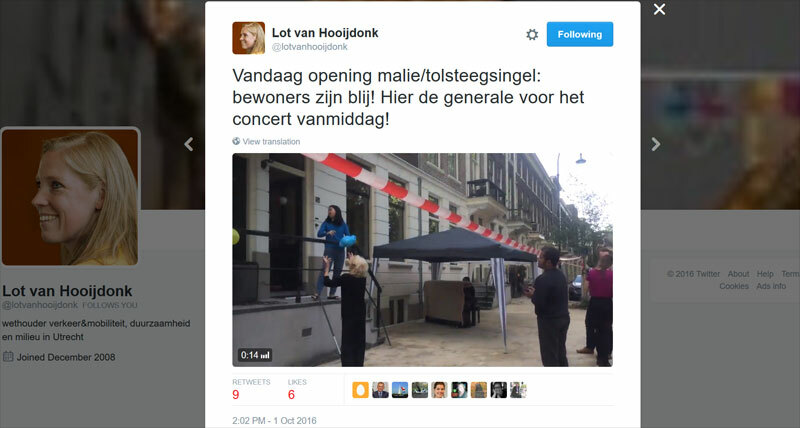 The alderman for traffic filmed the rehearsals for the opening party and tweeted a video. After three months of reconstruction works the opening took place at 1st October last. When you look at the result of the now finished reconstruction (that had a budget of 2 million euro) you can understand that the residents raised their glasses while enjoying a live performance of Bernstein’s “I feel pretty”! Utrecht’s city scape is rapidly getting a different face, and it truly is pretty! This video shows a ride in the before and after situation of Tolsteegsingel and Maliesingel respectively. After the first six months, an investigation reveals that the reconstruction was a success. The number of people cycling increased by 27% and the number of motor vehicles decreased by 30%, Verkeersnet reported on March 24, 2017. The investigation also reveals that not all motorists slow down sufficiently when other motor traffic approaches them from the opposite direction. About one third of all people cycling report that they feel unsafe when cars overtake them especially when they speed. For that reason, extra signs were posted to inform motorists of the new speed and the fact that they need to give people cycling enough space. Interesting profile, but still a lot of cars which use the bicycle lanes often as well. It is a pilot project, isn’t it? If so, are there thoughts about blocking going through cartraffic in the future? In other words, always 1 direction of car traffic allowed/possible in the various road sections? I’m inclined to agree with the Utrecht fietsersbond on this, I avoid cycling on the singel with the kids, there’s no protection from cars and even though most are good, it only takes one 17 year old in daddy’s lease car to spoil your day. (I reported a driver who actually looked more like 13 not far from there for beeping loudly behind us on bikes and passing way too fast and close). Ideally the volumes will go down, I see the point, but that stubborn minority of car centric petrol heads are not interested in saving the planet or beter samenleving. Segregated lanes do save us from those drivers that shouldn’t even be allowed scissors. Unless they plan on being stricter about who can drive in the first place, the numbers will keep going up. This seems like what my city is doing here in Virginia, using cyclists and cycle infrastructure as traffic calming. A major motor vehicle route was this summer with 5 foot wide unidirectional bike lanes on either side with 2 foot wide buffers (i.e. paint, no structure) between bike lanes and motor traffic lanes. Buses are expected to pull INTO the bike lanes to pick up passengers at several points along the route, likewise delivery, maintenance, trash, and even broken down cars are expected to pull INTO the cycle lane. I expect my city to do this because we have almost no utility cycling, but I don’t expect it from the Netherlands. I’ve been reading this blog for a year now and I would have expected this design with much lower traffic volumes. Looks doable when you cycled there, but how is it during rush hour? I imagine there’s just going to be too many cars there fot it to be pleasant and safe enough to mix with cyclists. During rush hour it’s not nice. There are still too many cars. “The motor traffic space has been narrowed, from about 5 metres to just 2.5 metres for all traffic in both directions.” This seems to be wishful thinking by the planners: every car in your video uses the cycle lane as well. The cycle lane on the side where car parking allowed isn’t really 2 m wide anymore in practice either: where there are parked carts, the usable width is probably just 1 m because you need to keep some distance to the cars. 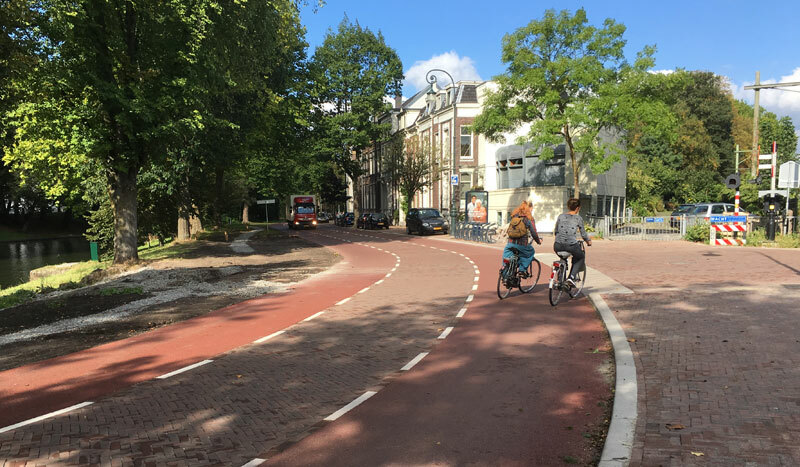 While it looks better than before I can feel with the Cyclists’ Union’s critique: It looks a bit as if Shared Space planning like this is becoming the norm in Utrecht (also see the reconstructed Adriaen van Ostadelaan). What a bunch of beautiful concepts in such a small place! I just adore pavement design at crossroads. It was hard to me to realize that it is actually a crossroads. I also love removing of traffic lights. And the bidirectional car-lane… I can not imagine it in my country. Why is bicycle parking (for example at very beginning of video) turned in such a way that you have to circle around it, in order to park your bike ? Wouldn’t it be much more comfortable if it would face the road ? Is that standard case in Nederland ? Yes, that’s standard. People might take a long time parking or preparing their bike (mounting children seats, removing heave luggage, adjusting some other bikes in the rack before they can add theirs). It’s far more convenient if that all takes place on the sidewalk, instead of on the road. They’ll typically slowly cycle the last few meters on the sidewalk. Why is the footway on the left so narrow? That is not even enough for a wheelchair. Oh, and by the way, can you tell me at what motor vehicle volume cyclist must be separated from motor traffic? I am not sure. That is a restored gravel path in the park. Not an actual footway. That is on the side of the houses. Whether or not separation is recommended is not only depending on the volumes of motor traffic but also on those of cycling, as well as speed limits and number of motor traffic lanes. Not one answer possible. Dutch guidelines say that about 2000 cars/day is acceptable for mixing cars and bikes, and the speed should be below 30 km/h. 6000 PCU is an awful lot of traffic, separation is definitely required. Here we see the B2-profile. It is made for a peak of 600 cars and 6000 pcu. @Marijn But these numbers seem to be based on a hypothesis rather than a research. 6000 PCU means that the street is filled with cars and there is no way cycling in mixed traffic could be pleasant in such conditions e. g. for children. And cyclists need as much safety as pedestrians – they can tolerate about 10-20 km/h higher speed of traffic because they move faster, but there’s no reason they should be mixed with higher traffic volumes. As an armchair critic, this road does not appear to FEEL like a 30 km/h road. In fact, there is at least one vehicle in that movie that is being driven at a speed much closer to 50 km/h. Yes, the paving (ugh!) does optically narrow the street, however I would have thought that the whole design would still have been better to either re-route the vehicular traffic from the street or add a bit more physical definition such as the low kerbing to better define the vehicular lane. I realise that dutch road paving is generally smoother than other countries. I would have expected that drivers would, over time, prefer to drive on the asphalt areas for a slightly smoother and quieter journey. That would definitely occur in other countries. Are you sure the residents are not celebrating that their street isn’t as ugly as it was and not for any other reason? I’m with the Cyclists Union on this one too, even though it is so much better than what I have where I am living. 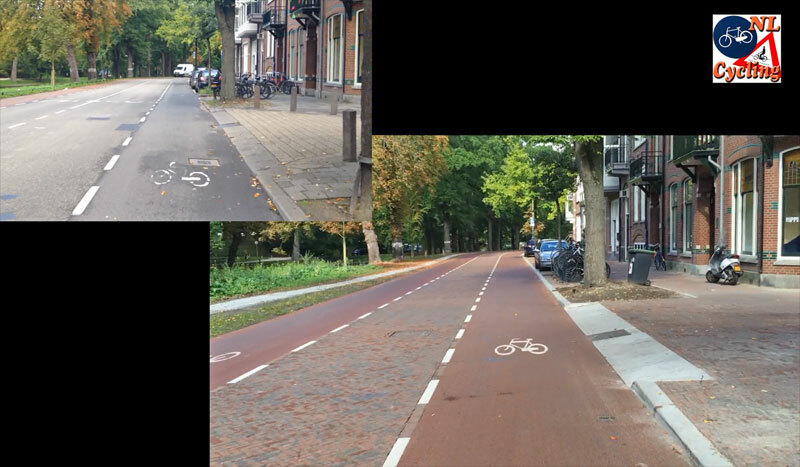 This entry was posted on 11 October 2016 by Bicycle Dutch in Original posts and tagged before and after, ride, urban design, Utrecht.